Digital Terrestrial Television (DTT) is one of a few ways of receiving Digital Television (DTV) at home. However, in order to receive DTT transmissions and fully realise the benefits available from this new medium the choice of antenna and its positioning needs to be carefully considered. The antenna (or aerial for us Brits) is the first and arguably the most important link in the chain to receiving a high quality signal for our TV or digital TV recorder. If you live in an area of poor reception or do not have the correct type of antenna, then no matter what you do later in the chain, performance is likely to be compromised. While this article provides an introduction to the antenna issues that directly affect the quality of reception, your local antenna installer should be able to advise which antenna is best suited for your particular location. While Digital Terrestrial Television (DTT) can offer improved picture quality over conventional analogue TV by eliminating traditional picture reception problems such as ghosting, a reasonable signal strength is still required. A weak analogue TV signal is easily recognised because it will suffer from increased noise or ‘visual snow’. Digital TV however will continue to provide clean reception until a minimum threshold is reached. Beyond this the digital data can no longer be accurately decoded and the output from the TV tuner will cease. A drop of 3dB on a Digital TV or set-top box is enough to make the difference between crystal clear reception and no reception at all. However, before this point is reached, parts of the digital signal will become lost or corrupted. While the sophisticated error correction algorithms used in DTT decoders can mask these effects to a certain degree, this is second best compared to having the full quality original signal, which is only achieved with a good quality antenna installation. To extract the maximum signal strength from any received transmissions, the associated antenna needs to be correctly matched to the local transmitter’s frequency band / group and polarisation. In the UK the coloured plastic cap at the end of the antenna indicates which group the antenna is designed for. Most TV antennas are of a specific type of antenna called Yagis. A Yagi antenna comprises a number of parallel elements or arms along a rod, a dipole (which collects the actual signal) and a reflector at its rear. A Yagi antenna is directional and is designed to have a high gain (signal ‘amplification’) to pick up distant signals. 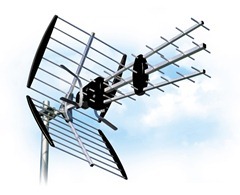 The more elements that a Yagi antenna has the higher its gain and therefore the more sensitive it is to weak signals. Being directional the antenna must be pointed at the transmitter. It will pick up signals very well from its main direction, but much less so for stations from alternative directions. 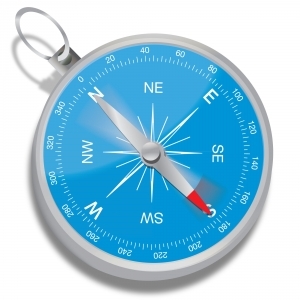 However, this directionality can be beneficial in rejecting strong, unwanted signals that lie in different directions from the main signal. Television antennas can be broadly classified into two categories, those chosen for a specific frequency band or channel group and those designed to receive all of the channel groups; wideband. Grouped – This antenna is best suited to areas where reception is poor as it can have a higher gain than its wideband counterpart. A grouped antenna usually has a coloured cap denoting which group it belongs to. Wideband – This antenna has a lower gain than its comparable grouped antenna and as such is best suited for areas with good to moderate signal strengths. As Digital TV signals in the UK are transmitted on the same range of channels as those used for analogue TV, it may be possible to receive a digital signal using an existing grouped TV antenna. However, DTT transmissions are sometimes transmitted from more than one group, in which case it is best to consider installing a wideband antenna if you wish to receive all of the available channels reliably. Having chosen the correct antenna, it now needs to be correctly positioned and installed: this is best done by a specialist digital TV antenna installer. Digital TV signals in the UK are usually transmitted using horizontal polarisation from a main transmitter and vertical polarisation from a repeater transmitter. To maximise the efficiency of the antenna system, the antenna should be aligned to receive the appropriately polarised signals from the local transmitter (i.e. in the case of a horizontally polarised signal the rods of the antenna should be horizontal). The antenna should be directed at the nearest TV transmitter for maximum signal strength as TV signals travel in straight lines. All antennas should be located away from possible sources of electrical interference such as mains wiring or digital equipment (e.g. computers). It is also preferable not to point the antenna through any metal work or nearby building structures as these will reduce the received signal strength. In most cases, the higher the antenna can be mounted the better the reception is likely to be. The increased height is also likely to minimise any signal masking effects from local buildings or geographical features. Loft mounted antennas should be mounted away from water tanks and metal pipes. 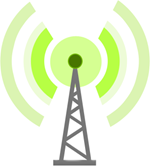 Indoor antennas may also be adversely affected by the building’s construction (e.g. reinforced concrete or steel frames). Digital TV antennas are designed with a 75 Ohm output impedance to ensure compatibility with the Digital TV tuner. For optimum performance a 75 Ohm ‘satellite grade’ coaxial cable (type CT100) should be used between the antenna and TV. All connections should be made using quality connectors, with appropriate precautions being taken for weather proofing of external connections. In cases of very weak reception or where long cable runs are required, an antenna amplifier may be necessary. The amplifier should be mounted as close to the antenna as possible (a masthead amplifier) and matched to the correct local frequency band. In weak reception areas an amplifier should be considered a ‘last resort’, a higher gain antenna on a taller mast will generally give better results. Digital Television enables high definition TV to be received at home with a minimum of fuss or capital expenditure. While some Digital TV stations may be received using a standard TV antenna, the best performance will always be achieved by using a properly installed antenna of a type that matches your local frequency range and signal strength conditions. Remember, if in doubt please contact your local installer for assistance. Hi, Do you have some more information about your aerial as they don’t normally have a power pack, so you must have a special amplified one I’m guessing. Could you also explain a little more about how your 2nd TV is indicating “cable”? I have Yagi type aerial in the loft. I receive some signals (weak) from an alternative direction that I would like to enhance, but with minimal effect on the forward direction. I was thinking of somehow masking the effect of the reflectors to see the effects. Has anyone any ideas how I might achieve this. The aerial cannot be moved. Strictly speaking it could be rotated somewhat, but I don’t want to lose the effect of the main transmitter, so I would be reluctant to try this. I have considered the option of two aerials, but I doubt if my tuner could cope. I use a iDTV. I beleive that the aerial is wideband, and is vertically polarised. Combining two aerials is likely to be problematic, but you could install and second aerial and an A/B switch so when you wanted to watch channels from the secondary aerial you could flip the switch. 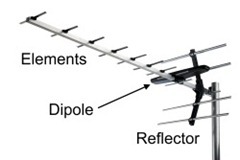 Alternatively if the secondary signals are also vertically polarised you could use a Yagi aerial with less gain (less elements) which would consequently be less directional and may help to pick up the additional channels, with perhaps a slight offset of the aerial towards the secondary transmitter, but it’s a bit of a bodge as you will undoubtedly get less signal from your primary transmitter.